Prototype: 2 different design four-axle sliding tarp cars. 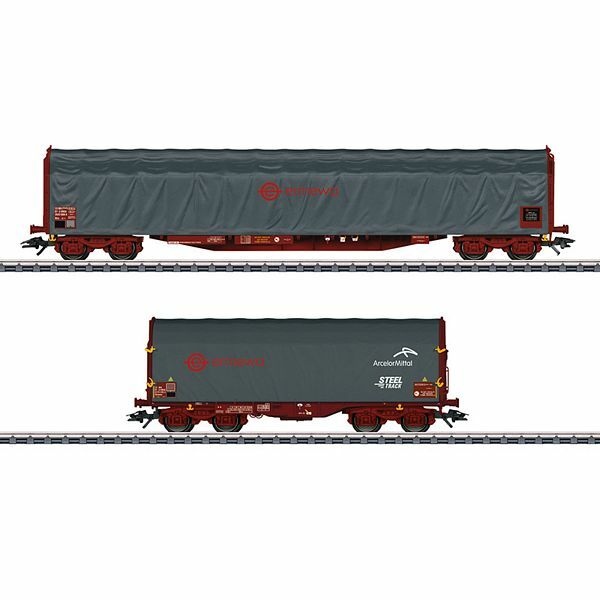 1 type Rils long four-axle sliding tarp car. European standard design with a length of 19.90 meters / 65 feet 3-7/16 inches. 1 type Shimms short four-axle sliding tarp car. Privately owned cars for the firm Ermewa, registered in France. The cars look as they did around 2014. Model: The cars' trucks are type Y 25. The cars have many separately applied details. Closed tarps are modelled on the cars. The cars have different car numbers. Both cars are individually packaged and also have a master package. Length over the buffers for the type Rils 22.9 cm / 9". Length over the buffers for the type Shimms 13.8 cm / 5-7/16". DC wheelset E700580.